A year and a half after a lengthy, often rancorous debate over immigration reform filled the chambers of a stalemated Congress, the issue appears to have receded in importance among one of the groups most affected by it—Latinos. Only three-in-ten (31%) Latinos rate immigration as an “extremely important” issue facing the incoming Obama administration, placing it sixth on a list of seven policy priorities that respondents were asked to assess in a nationwide survey of 1,007 Latino adults conducted from December 3 to December 10, 2008 by the Pew Hispanic Center, a project of the Pew Research Center. The top-rated issue among Latinos is the economy; 57% of Hispanics say it is an extremely important one for the new president to address. Education, health care, national security and the environment all also rate higher than immigration as a policy priority among Hispanics, while energy policy ranks lower. Latinos, who make up 15% of the U.S. population, are by far the nation’s biggest immigrant group. According to Pew Hispanic Center tabulations of the 2006 American Community Survey, more than half (55%) of Latinos ages 18 and older are immigrants, and 47% of all immigrants ages 18 and older are Hispanic. 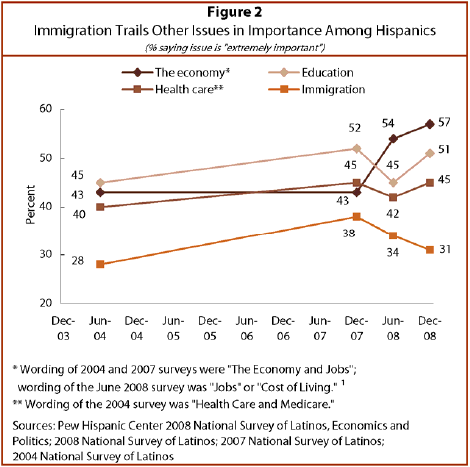 Even at the apex of the congressional debate over immigration reform in 2007, however, the issue never rose to the top of Latinos’ priority list. 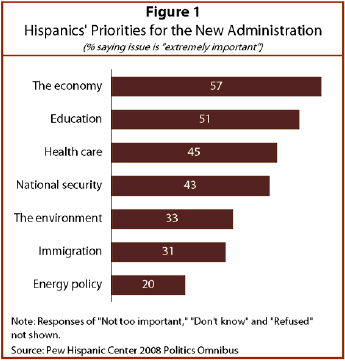 Of six issues asked of Latinos in a 2007 Pew Hispanic Center survey, it ranked fifth. But back then, 38% of Hispanics judged immigration to be an extremely important issue—more than the 31% who say the same thing in the new survey. The immigration issue has fallen in importance since 2007 among the general population as well. While 56% of all registered voters cited immigration as a very important issue in 2007 (Pew Research Center for the People & the Press, October 2007), this share fell to 49% in late 2008 (Pew Research Center for the People & the Press, October 2008). In last year’s presidential election, Latino voters were more than twice as likely as voters in the general population to be first-time voters—21% versus 8%. Among Latino voters ages 18-29, 47% were first-time voters. Hispanics are optimistic about the incoming Barack Obama administration. More than seven-in-ten (72%) say they expect Obama to have a successful first term. More than half (54%) of Latinos say that the failures of the Bush administration will outweigh its successes. In comparison, 64% of the U.S. general population holds the same view. Almost three-fourths (74%) of Latinos say they were more interested in last year’s presidential election than in the 2004 election. Three-in-four (75%) Latinos say they were satisfied with the field of presidential candidates in 2008. Overall, 83% of Hispanic voters say they learned enough from the campaigns to make informed choices. Almost four-in-ten (38%) Latinos say they were contacted and encouraged to register to vote or to get out to vote. Among Latinos contacted in the 2008 election campaign, 59% say they were contacted by the Obama campaign, while 43% say they were contacted by the McCain campaign. Television was the most popular conduit of news about the 2008 presidential campaign among Latinos. More than eight-in-ten (82%) report obtaining most of their election news through television. Eighteen percent used newspapers to get most of their election news, 18% used the Internet for most of their news, and 10% of all Latinos obtained most of their campaign news through radio. In addition, 21% of respondents report getting at least some election news from the Internet. Almost one-quarter (23%) of Latinos who obtained campaign information from television report that the information was in Spanish, while one-third (33%) got their television news in English; 44% obtained television news about the election in both languages. More than half (51%) of Latinos say they participated in at least one political activity other than voting during the 2008 election season. More than one-third (36%) say they used the Internet to research a candidate; 26% tried to persuade someone to vote for or against a particular party; 18% say they displayed material or wore clothing related to a political campaign; 11% say they attended a political or campaign-related event; 9% say they contributed money to a candidate; and 5% say they volunteered or worked for a political candidate. Forty-four percent of Hispanics say that the recent election has made them more likely to participate in politics in the future. This report is based on two bilingual telephone surveys. The first, the 2008 National Survey of Latinos, Economics and Politics, is a nationally representative sample of 1,540 Hispanics ages 18 and older. Interviews were conducted from November 11 through November 30, 2008. The margin of error for the full sample is plus or minus 3.0 percentage points at the 95% confidence level. The second survey, the Pew Hispanic Center 2008 Politics Omnibus, was conducted among a nationally representative sample of 1,007 Latino respondents ages 18 and older, from December 3 through December 10, 2008. The margin of error for the full sample is plus or minus 4.5 percentage points at the 95% confidence level. For a full description of methodologies for both surveys, see Appendix A. This report utilizes results from two national surveys of Hispanic adults. First, the 2008 National Survey of Latinos, Economics and Politics, examines Hispanic adults’ views of the 2008 election and their participation in political activities in the 2008 election. The survey was conducted from November 11 through November 30, 2008, among a randomly selected, nationally representative sample of 1,540 Hispanic adults. The survey was conducted in both English and Spanish. The margin of error for the full sample is plus or minus 3.0 percentage points at the 95% confidence level. The second survey, the Pew Hispanic Center 2008 Politics Omnibus, was conducted among a nationally representative sample of 1,007 Latino respondents ages 18 and older, from December 3 through December 10, 2008. The survey was conducted in both English and Spanish. The margin of error for total respondents is plus or minus 4.5 percentage points at the 95% confidence level. For a full description of the methodology for both surveys, see Appendix A. The terms “general population” and “general public” are used interchangeably in this report to refer to the entire U.S. adult population, including Hispanics.